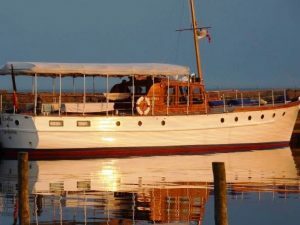 Builder: Matthews Boat Building Co.
For Roligt is a custom flush-deck day cruiser style motor-yacht with dual cabins designed and built by the Matthews Boat Company in 1903 for automobile icon James W. Packard. She is one of the early boats know as a Naptha launches and was one of the largest on Chautauqua Lake displacing nine tons with an overall length of 44ft. 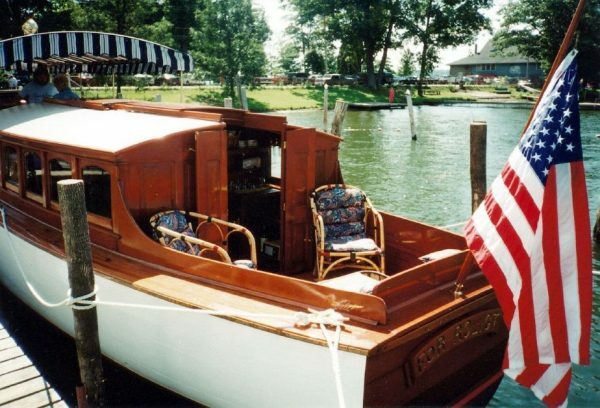 The hull planking is made from white cedar and her structural parts are white oak. All interior trim is made from mahogany. Most of the fittings are original and made of bronze or brass. In 1970, an entire new bottom was installed. 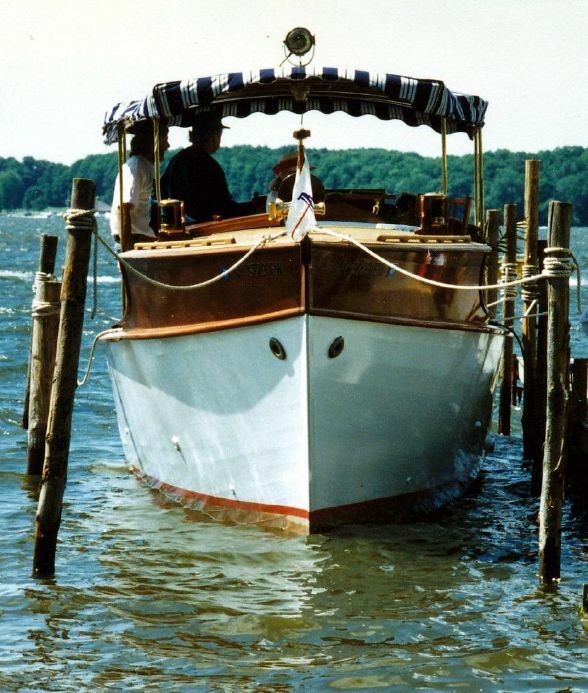 A 24ft white oak log was cut in Chautauqua County for the forward part of the keel; and another 18ft section was spliced aft. In the same year she became a postal carrier and honored by several personal stamps. 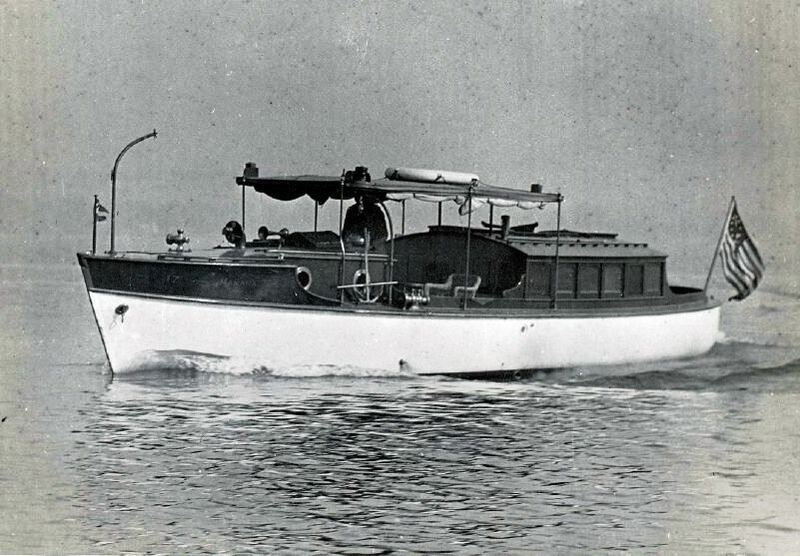 First powered by a four cylinder vertical Sterling engine which stood head high in the forward engine room, which was replaced by J W Packard with one of the first Packard Marine Engines. 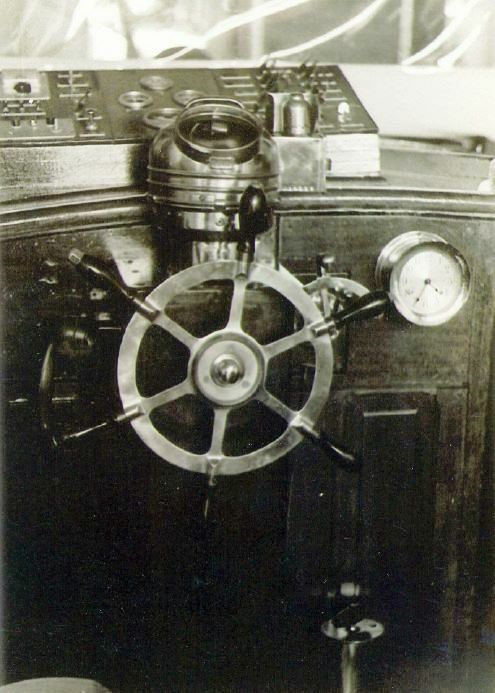 This has been subsequently replaced by several power plants; which were moved back under the Captains Bridge, allowing the old engine room to be converted to a chart room and Captain’s Quarters. 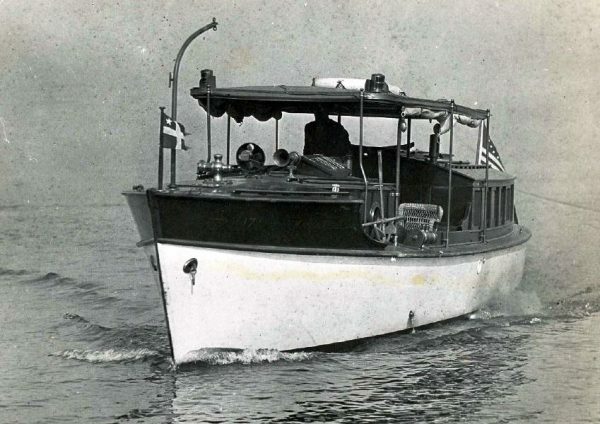 According to the 1903 official report by R.J. Barrows Secretary of Navigation Commissioners of Chautauqua Lake, “CARLOTTA” know now as FOR ROLIGT was the first registered on the lake that year, Owner J.W. Packard. Mr. Barrows comments in his annual report – 19 new Launches have been added to the commissioners list this season. This brings the total of (registered gasoline Launches) to 125. 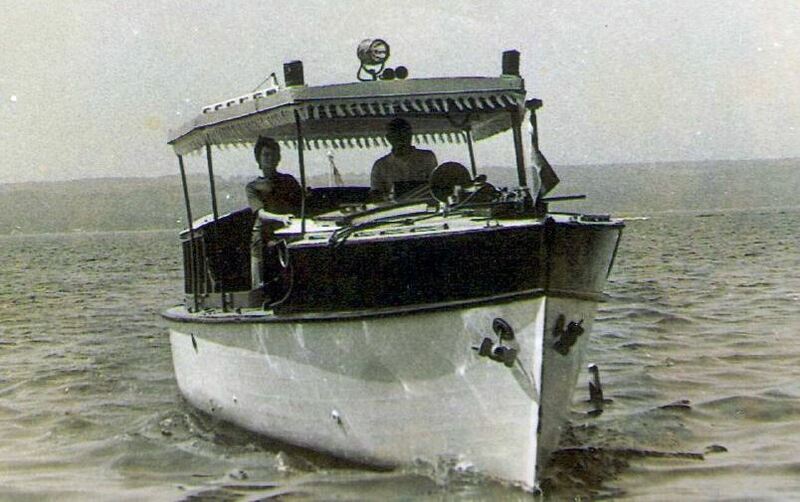 Mr. Barrows then continues, “As there are many under construction ,it is safe to say Chautauqua Lake will be filled with these lively little pleasure craft”. 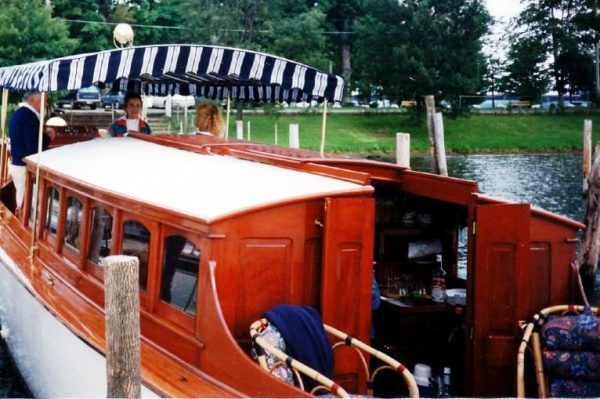 There are now more than 5000 registered motor boats on Chautauqua Lake. During J W Packard’s ownership of this yacht from 1903 to 1914, he changed the name from ‘CARLOTTA’ to ‘MANANA’. Most people do not know that the reason for the change which was typical of J W’s wonderful sense of humour. Every Sunday Mr. Fred Armitage of Jamestown, who was a close friend of J W would come to the lake and help with the many various small jobs on the boat. These weekly visits became almost a ritual of friendly associations and personal enjoyment for both men through the years. As years went on Fred showed up later and later to the point J W felt Fred might not arrive until tomorrow (Manana), so in honor of Fred’s late arrivals J W renamed her “MANANA”. She continued to have that name for another 62 years. 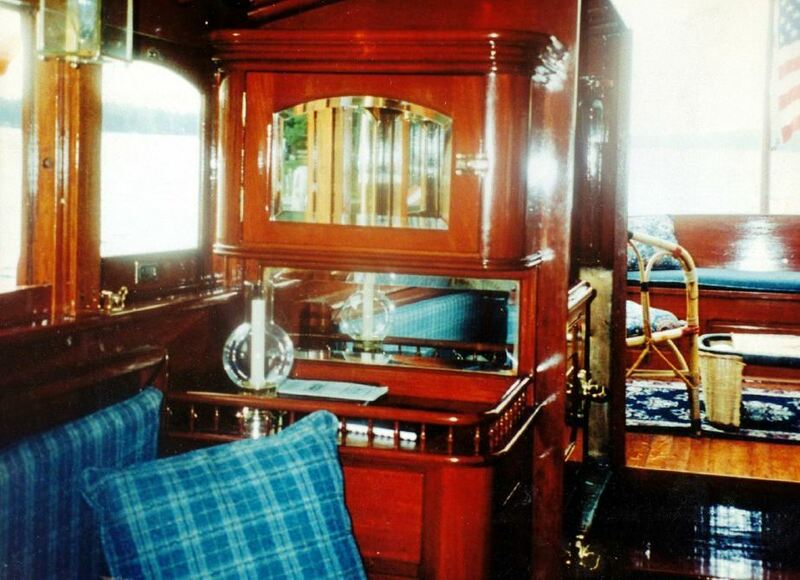 Beautiful antique copper lined galley is located abaft the main cabin starboard side, directly opposite the Main Salon. Original running and searchlights are all brass and were manufactured prior to 1890. These had been converted to electricity. A stunning Brass Binnacle (circa 1875) now sits proudly on the Captains Bridge, which is illuminated by a whale oil lamp. All brass was made and stamped by the Revere Copper Company which was the business that operated North America’s first copper rolling mill. It was started by Paul Revere in 1801 in Canton, Massachusetts and developed a commercially viable process for manufacturing copper sheets. 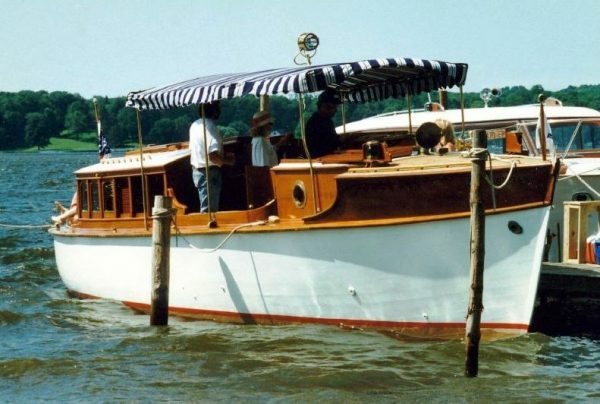 For Roligt is a unique part of maritime history, a very rare survivor from the early pioneering years of motor yachting in the 20th Century. 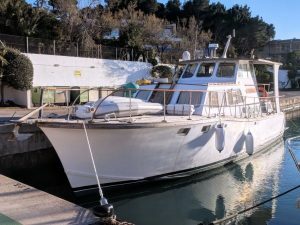 Now over 113 years old For Roligt has been restored over a seven year period to almost exactly her original specification, retaining all the original specially made fittings, as can be seen from the 1930’s black and white photographs. 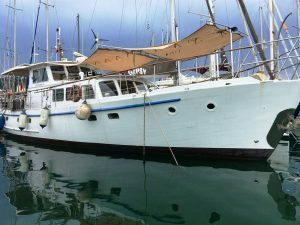 A very special and beautiful motor-cruiser ideal for lazy days afloat, for entertaining family and friends or just pride of ownership.